Yesterday morning a hefty M7.6 temblor emanated from the subduction zone beneath Costa Rica, setting buildings swaying, pools sloshing, and people scrambling from Panama to Guatemala. The death toll stands at two, which is remarkable for a quake of this size that didn’t even hit offshore. This may be due to its moderate depth (40km) and relatively remote epicenter, but there were plenty of people that were rocked hard. Costa Rica apparently has a rather video-savvy populace because there are already a bunch of videos of the quake hitting, and as usual, I’ve compiled them here for you. Now let’s get to the video footage. First of all there’s the video that’s been replayed by many news organizations that shows some pretty incomprehensible footage from a flailing camera atop a building. meh. In a more interesting video that really shows the power of the quake, a garage full of vehicles bounces around in a small town outside of the capitol, ~80 miles from the epicenter. In this video you can really see changes in the direction of motion as differently “polarized” surface waves ripple through. I also find it remarkable to note how much time passes before the really strong shaking begins, perhaps lulling people into a false sense of complacency. There are other videos of bouncing cars, but none as dramatic as that bus. A couple of security cam videos show heavy shaking of people and goods as the quake hits businesses around the country. The quake elicits a variety of reactions from clerks and customers at a convenience store, who sprint or saunter out of the store depending upon mood. It looks hot there. A surprised ex-pat marvels at the power that throws her pool water around, even though she herself felt nothing. This should be familiar to the southern Californians who experienced the 2010 Easter Sunday quake at a substantial distance. Then there’s the aftermath. In one case a local demonstrates the exact wrong thing to do, showing up at the beach to film a potential tsunami, that he soon learns is not coming. Instead he captures shore-parallel fractures in the sand from gravitational failure during the shaking. San Francisco-based photographer Shawn Clover came up with a creative project: not only did he re-create classic photos of the 1906 earthquake’s destruction from the same vantage points as the original shots, but he’s blended the old and new together in surreal, oddly amusing, and moderately alarming photo stitches. Where was the exact spot the photographer stood? What was the equivalent focal length of his camera’s lens combined with the film medium? How high off the ground was the camera? Where was the sun in the sky? Everything needs to be precise when layering two photos on top of each other. The fascinating perspectives capturing the destroyed “then” and the recovered “now” would make a superb earthquake awareness campaign, don’t you think? This video is a must-watch. A fortunate National Park Service biologist and a Scientific American reporter interviewing him were standing at a deep natural pool in Death Valley when it began to be dramatically rocked by an earthquake that had occurred 2,000 miles away. Pond? Not if there's an earthquake on the other side of the planet. Devil’s Hole is a deep, shaded, natural pool near Death Valley, in Nevada, that is home to some very specialized species of fish and is thus heavily studied. It’s also just the right size to be excited by low frequency “teleseismic” waves from distant earthquakes. When large earthquakes happen anywhere on the planet, the seismic waves they emit ripple around the globe, detected in most places far from their epicenters only by extremely sensitive instruments. For instance, when the 7.4 earthquake struck the coast of Mexico a few weeks ago, it excited surface waves that raced dramatically beneath our feet in the U.S. imperceptibly to us. By the time seismic waves reach these great distance they are both weak and extremely low-frequency. Sensitive seismometers, however, easily pick up their signal. Seismogram from central California (Monarch Peak) showing a 7.4 earthquake in southern Mexico. Note that during the strongest "shaking" the wave crests are ~15 seconds apart. Too slow for us to feel... just right for a small, sloshing pond. Look at this seismic record from a station in central California on March 20. The M7.4 earthquake dominates the record even though this station is nearly 2,000 miles from the epicenter. The reason people in California weren’t knocked off their feet was that at that distance the seismic waves have a frequency far below anything we could expect to “feel”. If you look at the strongest waves recorded (mostly in red), you’ll see that there are about four peaks per minute, meaning that each wave takes about 15 seconds to pass. What you’re seeing is the ground oscillate back and forth every 7.5 seconds. Count that out: wayyyy too slow to feel. If, however, you’re a small body of water of just the right size, this is the perfect amount of time to make you slosh over your banks. Think about being in a bathtub: if you shake really fast, the water splashes a little; if you slide very slowly, the water moves smoothly around you; if you swish back and forth at just the right medium speed, however, you can surpass the speed with which water can spill around you, and you end up making it slosh wildly. That’s basically what’s happening in the video above at Devil’s Hole. 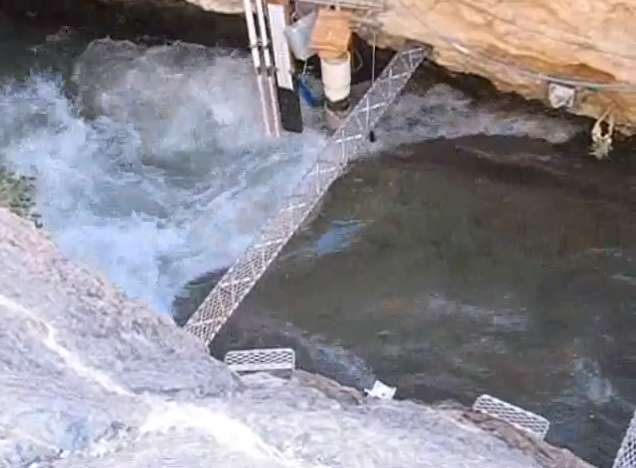 Update April 8, 2012: The effect apparent in the video may not be a result of transverse seismic waves causing resonant sloshing, but may stem from compressive waves squeezing the aquifer and causing water level to fluctuate. Similar phenomena are further described on this USGS info page, and the theoretical background is laid out in this review paper in Science. In the video, the undulation of water level starts around 10-15 minutes after the quake’s origin time. The videographer checks the time at ~18:13, and he’s referring to Coordinated Universal Time. The Quake started in Mexico at 18:02. It’s really a quite spectacular demonstration of the passage of these very low frequency waves of motion in the rock. You can’t deny they’re happening when the pool beneath you is overflowing its banks! Mexico City Earthquake Early Warning–it works! USGS Shakemap based on instrumentally recorded shaking intensity and site conditions. Note the pockets of stronger shaking (green) in sedimentary basins well north of the epicenter. Want to see what happens when you can know an earthquake is coming? Mexico has footage that’s got you covered. 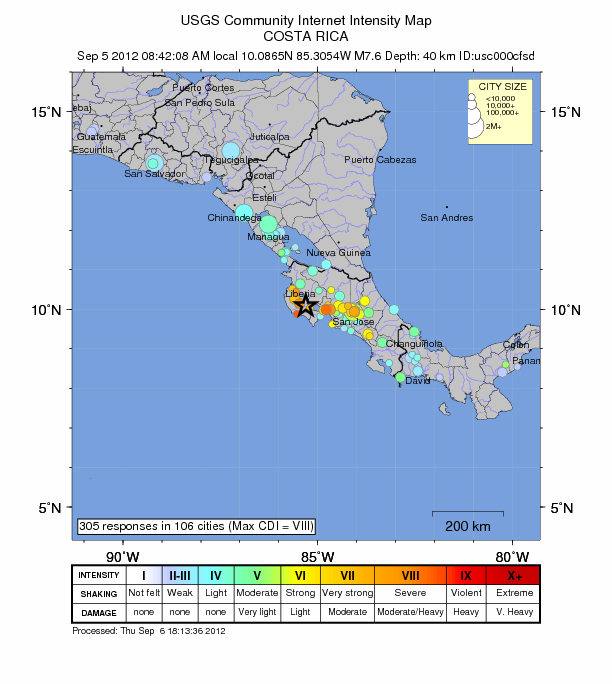 On March 20, 2012 a very large earthquake rocked southern Mexico. With a magnitude of 7.4 and a moderate depth of 20km this quake was widely felt, and resulted in damage and casualties near its epicenter in Oaxaca. But Oaxaca wasn’t the only place that got rocked. Mexico City, more than 200 miles north, felt the waves amplified as usual by the lakebed sediments it’s situated upon. The sedimentary basin upon which Mexico City lies is the seismological bane of the city, trapping and amplifying seismic waves like a swimming pool. This unfortunate setting has devastated the city in the past, but is at least widely recognized as a liability. Because the effects of distant earthquakes are amplified in the Distrito Federal, it’s actually an ideal candidate for an early warning system that relies on the time it takes damaging seismic waves to reach a sensitive area once they’ve already been detected. Along with Japan, Mexico is one of the few countries in the world with a functioning early warning system, and last week’s large quake exercised it. Once large-amplitude shaking is detected among the nation’s seismometers, a signal is transmitted immediately to activate alarms in the capitol city that warn residents shaking may be imminent. Damaging seismic waves travel at a little over 7,000 mph, so at 200 miles from the epicenter, Mexico City would have upwards of a minute and a half of warning before they hit. Of course the seismometers couldn’t detect the seismic waves immediately as they’re initiated, and it would take even more precious seconds before they could reliably identify the quake as a dangerous magnitude, but once they did the alarm was sent. Footage of a Mexican Senate hearing captured the whole event. A shrill alarm starts going off at the beginning of the video, and the man speaking is interrupted by concerned colleagues who immediately and orderly evacuate the room. The alarm shuts off 50 seconds into the video. Although mild shaking may have begun at this point, capturing the attention of a couple of senators by swinging ceiling fixtures, substantial shaking doesn’t begin until just after the 1:05 mark. From there it clearly continues, noisily rocking light and audio apparati suspended from the ceiling. The electricity flickers on and off a couple times, and the rest of the recording is just the earthquake dying down. This video is a beautiful demonstration of an earthquake early warning system in action, complete with the successful evacuation of a crowded room. If only we all had the fortune of Mexico City to be hundreds of miles from the earthquakes that plague us. Bonus video: an extremely fortunate camera crew was set up along the Paseo de la Reforma in Mexico City shooting HD video of a tall statue before the earthquake started. They realize shortly into this video that the ground is swaying, and they capture it all as the towering statue starts oscillating heavily and noisily. On March 25, 2012 a magnitude 7.1 earthquake struck central Chile–the same region that was rocked in 2010 by an the Great 8.8 quake. This one was much smaller than that, and at a depth of 34km was more mild at the surface than it could have been, but it nonetheless walloped the region just before dusk on Monday, and plenty of people recorded it. In fact, it interrupted a soccer match between two Chilean first-division club teams, although the players didn’t much care. Below is a sampling of footage from elsewhere in Chile. Dogs and people are alarmed, and the plants and houses jostling sure make a lot of noise. As the shaking winds down you hear all the car and house alarms set off by the temblor. In what may be the most dramatic scene from this quake, a mall-goer captures the chaotic noise and panic of the earthquake shaking a mall full of people. Despite the relatively modest shaking, the sound of so much rattling overwhelms the situation, and the rush to leave the building means that emergency procedures must still function properly or there’d be a different disaster to contend with. If you watch those on YouTube you’ll find a multitude of others in the “related videos” but they’re mostly of poorer quality, so I decided I’d leave you with those three… the best picks. The Chileans are fine, and there was no remarkable tsunami, so it wound up being simply a firm reminder of the forces beneath their feet. Instrumentally recorded shaking intensity throughout Washington state, interpolated among the network of local seismometers that recorded this earthquake..
February 28 marks the anniversary of Washington state’s most recent large quake, the M6.8 Nisqually earthquake of 2001. The epicenter was at the southern end of Puget Sound, and the 10:54am quake heavily rocked Washington’s most populous region, including the capitol Olympia, Tacoma, and Seattle. This quake was a relatively “small” quake for the region, considering the Pacific Northwest is periodically rocked by massive subduction zone “megaquakes” like the recent ones in Japan, Indonesia, and Chile, but at a respectable 6.8 and located so close to metropolitan areas, it was a violent and destructive quake nonetheless. It represents a different kind of quake risk to the Pacific Northwest from that posed by the much-publicized Cascadia subduction zone. This quake occurred in the crunching and crumpling upper plate as it grinds over the diving Pacific ocean slab. In addition, there are a couple of radio recordings of the quake happening, as documented in this article. This was a significant event for Washington state, so lots of money and research has been dedicated to studying it. Much of this research is highlighted through the University of Washington’s Nisqually Earthquake Information Clearinghouse, a great site for more detailed information about the quake and its effects. There’s also an excellent blog dedicated to chronicling the experiences of Washingtonians during and after the earthquake, at http://isquallyquake.wordpress.com. The Southern California Earthquake Center has also put together an info page comparing the 2001 Nisqually quake to L.A.’s similarly sized 1994 Northridge Earthquake, at http://www.scec.org/news/01news/feature010313.html. As always, mark this anniversary by considering your own preparedness were an earthquake like this to strike your hometown. Every time it happens we learn more, so we should fare better after each new earthquake. 200 years ago this February 7, on the western frontier of European settlement in North America, the pioneering westward expanders and the natives whose land they were colonizing were thrown from their sleep in the deep wee hours of a winter night by the culminating temblor of a harrowing, months-long sequence of major earthquakes, aftershocks of which continue to this day. Map of shaking intensity interpolated from historic accounts of the 2:15am mainshock of the New Madrid sequence. Map courtesy Susan Hough, USGS. The so-called New Madrid earthquakes–named for a small Missouri settlement near the modern-day borders of Kentucky, Tennessee, Illinois, Indiana, and Arkansas that lay nearest the center of this cataclysmic seismic sequence–are the largest to have struck the eastern United States since well before they became the United States. In the recorded history of western settlement of North America, no quakes outside of the mountainous west match them in size and scope, and only a few come close. Plenty of people have been and will be reporting on these earthquakes as we celebrate their bicentennial, including the organizers of the Great Central U.S. ShakeOut, which took place this morning to commemorate the massive culminating temblor of the sequence that started in December 1811. Even mapping software purveyor ESRI has put together a commemorative compilation of informative and beautiful interactive maps about the quakes (super cool compilation! If you click on one link in this post, let it be that one). It is worth reading some of these syntheses and reviews because the earthquake series itself makes a captivating narrative. It’s nearly impossible to imagine the terror with which these relentless temblors must have stricken the settlers, who were already braving the “wild” frontier of a foreign continent. Even the mid-continent’s native inhabitants had not experienced such a thing in scores of generations, and in the early 19th century no one would have had any reasonable framework in which to explain the occurrence of massive earthquakes. Because the New Madrid quakes occurred so early in our country’s recorded and geographic history, piecing together the events with a modern understanding of earthquakes and plate tectonics has required a great deal of sleuthing, and some of the details gleaned about them remain controversial, most notably their magnitudes (were they more like M7 or more like M8?). The uncertainty regarding the exact size of these earthquakes compounds the issue of determining the seismic hazard posed by recurrence of major earthquakes in the New Madrid Seismic Zone. To understand how seismicity may continue in southeastern Missouri we can look for patterns in the prehistoric record of earthquakes, but ideally we would like some idea of what forces caused these earthquakes to happen here. This remains an open question, and one in particular for which the question of the quakes’ magnitudes may be a crucial bit of information. Researchers have tried to use modern seismicity to constrain the behavior of large earthquakes in the New Madrid Seismic Zone, and some have interpreted the ongoing small quakes there as the tail end of an unsurprising aftershock sequence, suggesting that they don’t represent heightened seismic risk, but that in fact New Madrid is as likely as any number of other places in the eastern U.S. to have more major temblors. The ongoing scientific controversy over ambiguous interpretation of details of these quakes stems from the nature of the data. Researching “pre-instrumental” earthquakes is a pursuit that fuses seismology, history, and social science, in an effort to understand historic written accounts of the earthquakes in the context of their time and cultural setting. A somewhat recent article in Seismological Research Letters describes the endeavor of anecdotal seismology, and through some colorful examples illustrates how historical reports can be translated into seismological data, clarifying the sources of interpretive ambiguity. The marriage of historical and seismological research to inform our model of seismic events in the eastern U.S. could be and has been the subject of many volumes, so I can’t hope to cover it here. Instead I’ll draw analogy to this incredible sequence of earthquakes through videos and pictures from recent events, hopefully grounding some of the legendary accounts in footage of real and recognizable phenomena. It’s difficult to imagine what possible physical phenomenon could have led to this observation/claim… unless you understand that the New Madrid quakes–just like all other large temblors–resulted from slip along several geologic faults. At the surface, fault slip breaks and displaces the ground, moving one side in a direction opposite the other. In the case of the causative Reelfoot Fault, the surface trace cut right across the Mississippi River channel, dropping an upstream portion of the river relative to the adjacent reach downstream. This warping has been thoroughly investigated and modeled, and thanks to the September 4, 2010 Darfield earthquake–a M7.1 event that ripped across rivers on New Zealand’s flat Canterbury Plain–we have a beautiful modern analog of the occurrence. Aerial view of the Horata River spilling off of the fault scarp formed by the September 24, 2010 Darfield earthquake in New Zealand. Image courtesy Dr. Mark Quigley, University of Canterbury, Christchurch, NZ. Where the 2010 NZ rupture fault sliced across the Horata River, it diverted the water into surrounding farmland, effectively changing the course of the flow. This is precisely analogous to the diversion of the Mississippi that led to both the damming and formation of Reelfoot Lake, and the temporary diversion of river flow back upstream. There are a few processes that may combine to produce this effect. In the past year we’ve seen plenty of examples of sand volcanoes, the eruptive results of shaking-induced soil liquefaction. When subjected to seismic waves (as in this New Zealand aftershock, or the Tohoku quake below), these sand blows can be squeezed into fountains of substantial height. The force of a larger and longer earthquake would undoubtedly increase the height these reach. Extrusion of liquefied sediment by seismic waves isn’t the only coseismic phenomenon that may throw water high into the air: seiching–harmonic oscillation–of small bodies of water may throw water against their banks and up into the air. We’ve seen this dramatically demonstrated in swimming pools during a M7.2 earthquake, but natural ponds don’t necessarily have the splashing power of sharp corners and hard edges in concrete-walled pools. Nonetheless, with these two phenomena operating in tandem, the amount of water being thrown into the air by the quake would certainly be fodder for tales–legendary or not–of high fountains from the Earth. Finally, video the USGS captured at practically the epicenter of the M6.0 2004 Parkfield earthquake shows fairly violent lashing of late summer oaks in the California Coast Ranges. A tree along the San Andreas Fault in Wrightwood, CA, had its top snapped off in an 1812 earthquake, from which it grew two new crowns. The tree no longer exists, but others like it can be found along the 1906 rupture near Point Arena in NorCal. Image from "Mixed Matters"
Though the effects shown above do not amount to trees being thrown to the ground, the earthquakes that produced them were much smaller than the ones that struck Missouri. We have clear evidence along the San Andreas Fault of trees whose tops were snapped off during the 1906 earthquake. This is a common effect in the epicentral region of large quakes. This phenomenon is akin to but distinct from the Mississippi being diverted and running backwards. In fact the underlying process is more closely related to the processes that give rise to sand blows. Shaking liquefies water-saturated soils and they lose their shear strength, rendering them unable to support gravitational loads. Thus the land slumps, under its own weight or the weight of trees, houses, or riverboat moorings, downhill towards unencumbered free edges like river banks. This “lateral spreading” is commonly observed along river banks shaken by earthquakes, and results in lowering and inundation of the ground surface. Examples abound from earthquakes as geographically and tectonically various as the 1964 Good Friday event in Alaska, the 1906 San Francisco earthquake, the 2010 Haiti earthquake, and the 2010 El Mayor-Cucapah earthquake. In all of these events vast swaths of land shook loose and slumped ocean- or river-ward, and effectively “sank”. The video examples compiled above may not match the apparent drama of those recounted from 1811-12 Missouri, but I find it easy to imagine the cumulative results of decades and decades of re-telling on the details of these accounts. In any case, large earthquakes produce remarkable effects, and although many people around the world witness or experience earthquakes, still relatively few witness the truly violent shaking that occurs near an earthquake’s source. Written and oral accounts give us the most thorough picture, even if we have to take them with a grain of salt. Video may gradually be replacing verbal accounts in objectivity (no relying second-hand information! ), but it has yet to become as widely distributed and available as individual eye-witnesses. Christchurch, New Zealand, has suffered its fourth day (and 5th, 6th, and 7th big quakes) in barely over a year of what continues to be a brutal onslaught of seismicity. It began in September, 2010, with a magnitude 7.0 earthquake outside of town that caused billions of dollars in economic losses. The vigorous aftershock sequence of that quake was punctuated in February by a magnitude 6.3 earthquake east of the September rupture patch. This quake struck a direct hit on the city, killing 181 people and devastating the central business district. The liquefaction caused by these two quakes [pdf] has flooded and destabilized vast swaths of neighborhoods around Christchurch. After months of additional aftershocks, a 5.5 rattled the city in June, followed within hours by another M6.0, both yet farther east. The two of these caused additional destructive liquefaction throughout the city. They have been having their own series of aftershocks, compounding the tremors being felt as a result of the largest prior two quakes. Earthquakes in the Canterbury sequence September 2010 - November 2011, colored by intervals between the dates of the largest quakes. Note the eastward migration of the concentration of seismicity. Green represents the September 2010 M7.0 Darfield quake and aftershocks; Red represents the February 2011 M6.3 Christchurch earthquake and aftershocks; Blue represents the June Port Hills quakes and aftershocks. Cumulative number of earthquakes near Christchurch plotted over time. After each of the major quakes, the aftershocks die off in frequency at very predictable rates... but keep getting interrupted by new big quakes! Just before 2pm on December 23, as locals were no doubt greeting out of town relatives for a warm, summer Christmas, they were struck by a hefty magnitude 5.8 offshore, east of previous quakes. A couple moderate aftershocks followed on its heels, and 8 minutes later there was a 5.3. About an hour and a half later, in the midst of a whole slew of modest aftershocks, one of these turned into a 6.0 and rocked the city hard. There have been literally hundreds of aftershocks since then, including another M5.1. Cantaburians and their Christmas guests have undoubtedly managed very little sleep with the incessant jostling, and it takes no stretch of the imagination to understand how exasperated they must be with the relentless quakes. There’s a nice post at Highly Allochthonous about the tectonics of these quakes, and The Landslide Blog discusses some of the notable features of these two new quakes and their implication for quake-related politics and policies in Christchurch. I’ll jump into the mix here with a collection of footage from the latest events! The following videos capture what each of these latest quakes was like, and the gasps, sighs, and exclamations as residents reveal their exhaustion from the continuous trauma of not knowing what to expect from each new tremor that hits. ALL of these videos show beautiful separation of the P- and S-wave arrivals, in other words the rumbling versus the shaking. The warning from the extra few seconds of rumbling is thanks to the quakes’ location offshore and thus their relative distance from the city. The camera’s still running, and they’re trying to calm the nerves with a beer when the M6.0 hits. Not a great way to help cool the nerves–this guy’s surprise is evident. This next clip documents a far greater–but still pretty much justifiable–sense of panic. It’s actually heartbreaking to see how it begins with a news report in the background about the 5.8, optimistically trying not to jinx themselves by saying the quakes have died down over the hour. It helps illustrate why the M6, the largest of the three that day, was so demoralizing. Careful, there’s a hefty dose of adult language. Who can blame him? Here’s a set of videos from security cameras in various places. There’s a whole lot of lurching during passage of the surface waves. Another shot widely replayed on the news shows a woman darting from a shaking storefront. The following video is from a supermarket, and shows the chaos of the quake as well as the exasperation of the beleaguered residents. This family captures the quake from outside as they warn their children of more danger. It may sound like bleak consolation for the kid, but Dad’s right: nature has been nothing if not ruthlessly unpredictable here. Here’s what happens when an earthquake hits an unsuspecting region. We’ll begin with what I think is the most fascinating video from this earthquake. In this clip a video conference is interrupted by the shaking. You get a good sense for the surprise as people register what is happening, but the fun doesn’t stop there. As this conference room composes themselves, their teleconferencing coworkers deal with the quake as it gradually ripples across the country. The whole lot of ’em slowly and dramatically realize just how significant this earthquake was. It’s actually rather scary to watch their realization unfold. Next we have a fairly breathless teenager who had the presence of mind to grab his camera while his house in suburban Maryland rattled around him. Here a brother and sister are filming a little personal business promo when the quake rattles through the house they’re in in D.C. Mind the language. In perhaps my favorite coincidence ever, this guy is watching a house get haunted in Paranormal Activity 2 when his own house lurches in the quake. This next family is particularly in denial about what’s going on. It’s a lazy day in Maryland, and only the cat and the visiting friend sense the P-waves. Reality strikes them when the surface waves come rippling through. Here’s an unfortunately audio-less video from a sound stage in Maryland. As the quake ripples through Mount Vernon, George Washington’s early estate, we hear rusting, jingling, and rattling, and tourists move quickly away from the building. A motion-sensitive surveillance camera on the 7th floor of Camden, NJ’s city hall was activated by the quake and recorded most of the shaking. In this pretty cool video, the neighborhood kids are practicing whiffle ball when the earthquake rustles trees and rattles homes all around them. There are also a few home surveillance videos of dogs responding to the earthquake. They all seem much more sensitive to the subtle vibration of the Primary waves than humans are. Frager’s Hardware Store in D.C. has four great, high-definition surveillance videos of the quake happening, including the following. The fun starts after the 1-minute mark in each of them. This user has a suite of videos from inside the top of the Washington Monument as it gets jerked around by the earthquake. The final video I have to show is from Brooklyn, on the outskirts of the area affected by the quake. You can see just how subtle the quake’s effects are at this distance, but it’s nonetheless a very unusual disturbance, and the sudden fluidity of the ground is a rather disconcerting sensation. Fortunately there’s soothing guitar music. That’s pretty much my exhaustive collection. I know of a few more surveillance camera shots but they’re either poor quality or don’t show much at all. If you know of any others, don’t hesitate to direct us to them in the comments!